Understanding the options for getting your loved one the care they need is multifaceted. You want to ensure they are getting the care they need. Quality, comfort, and services available all must be factored in. Inevitably, you also have to count home care costs or the costs of an assisted living facility. The main options for seniors in need of care are home care or assisted living. Home care is provided in your loved one’s private residence. Caregivers attend to your loved one’s needs according to the services you select and during the scheduled hours you choose. Many home care agencies offer services provided through individual caregivers who are vetted and hired as qualified professionals. An assisted living facility will require your loved one to move into a new living space. Your loved one’s living space will likely be a room of some sort. Amenities vary widely between facilities. While living in the facility, your loved one will receive selected services and caregivers will be present at all hours. The ratio of residents to clients however is often more than fifteen to one. Medical services are often offered in such facilities. Paying for care for your senior loved one can be intimidating. The costs of care range widely. They also vary by state. Some costs can be supplemented or eased through financial assistance programs or long-term care insurance. These financial costs must also be weighed against your loved one’s wishes and preferences. It is common for people who are aging to prefer to remain independent in the comfort of their own home, even if some care assistance will be needed. Some studies have even shown that home-dwelling seniors enjoy a better quality of life than those living in facilities for the aging. According to a MetLife survey on long-term care costs, assisted living facilities tend to cost about $41,000 annually. 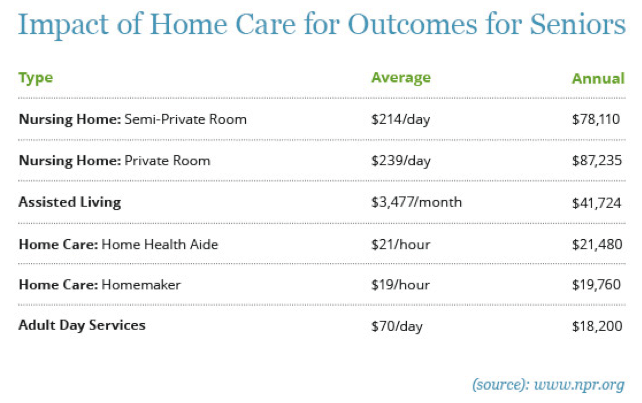 Home care costs ranged from $19,000-$20,000 annually. Because home care is customized it can often be more cost effective than a facility, which is surprising to many, because home care also provides one-on-one help. These figures vary significantly by state and individual circumstances. This helpful chart outlines some common cost factors and how they compare between home care and assisted living. These costs, although not entirely financial, can be burdensome for you, your loved one, and your family. Research and weigh your options thoroughly before making decisions regarding your loved one’s care. Be sure to learn about financial assistance options as well. There are many ways to pay for care that may affect your decision. Download our free guide on ways to pay for Home Care.